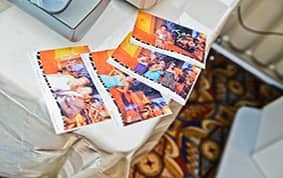 A wedding reception with Disney's Fairy Tale Weddings is more than just celebrating your new journey together with dancing and a delicious slice of cake. It is a chance to add an artistic touch of Disney magic! Invite your family and friends to partake in a creative experience they won't forget by capturing the celebration with art. Watch in amazement as a talented artist skillfully cuts a personalized memory. With a pair of scissors in hand, the artist will turn your shadow into a work of art with a classic silhouette, giving your guests a timeless memento. Ever dream about being a Disney Animator? Try your skills as an artist with a Disney Animator guiding you step by step in drawing some of your favorite Disney characters. This unique opportunity is fun for all ages and sure to be memorable! As you enjoy a reception filled with love and dancing, a painter will capture the moments in real time with a live painting. The blank canvas will come to life for a truly one-of-a-kind gift the couple will have to cherish for years to come. Sit down and relax as your portrait is transformed into a cartoon. A caricature artist will turn your guests into characters offering them an exciting keepsake to take home! 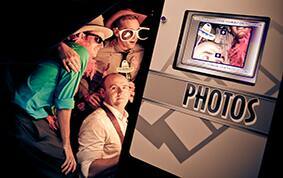 Whether you take serious or silly photos, a photo booth is a fun way for your guests to remember your wedding day. With the addition of playful props, from crazy hats and stick-on mustaches to sunglasses and signs, it will keep the guests entertained!